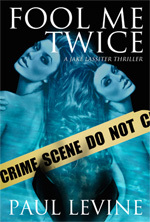 In Fool Me Twice, a grisly murder case takes linebacker-turned-lawyer Jake Lassiter from the beaches of Miami to the slopes of Aspen in his greatest challenge yet. With Jake the prime suspect in the murder of an associate found dead in Jake’s house, his neck is on the line if he doesn’t nab the real killer. But a mysterious ex-girlfriend and a dangerous rancher with a lethal nail gun stand in his way as Jake — accompanied by his delinquent nephew — follows a bloody trail that leads to a search for buried treasure beneath the Colorado ski slopes. The characters converge in an explosive finale in an abandoned silver mine, where Lassiter confronts his checkered past and his precarious future. Jake Lassiter’s career – and his life – hang in the balance. Jake Lassiter must figure out who are his friends and who are his enemies in this thrilling page-turner that the Los Angeles Times has described as “Delicious.” A fast-paced addition to the best-selling Jake Lassiter series, every page of Fool Me Twice will have readers desperate to know what happens next.